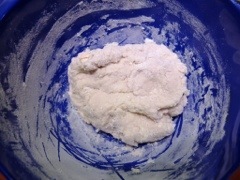 Combine plain flour and sugar in a bowl. 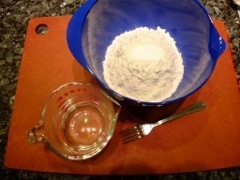 Add hot water gradually to the flour, stirring with a fork as you go. 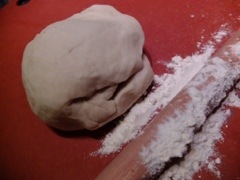 Cut your dough in half. 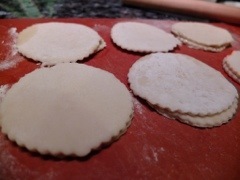 Roll out the first half on a floured surface to about 3-4mm thick and cut with large round cookie/ pastry cutters. 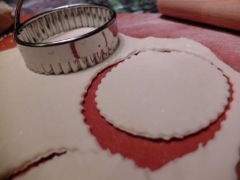 Gather the off-cuts together, re-roll, and re-cut until all the dough has been cut, including the other half. 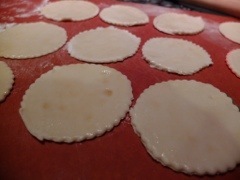 Lay out all the dough circles on a baking sheet, and brush the tops of every other circle with sesame oil. 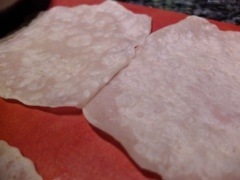 Sandwich each pair together, with the sesame oil inside. Roll out each pair as thin as you can – don’t worry about it sticking, it just won’t because of the oil which makes it elastic and very flexible. It will start to bubble within 30 seconds. 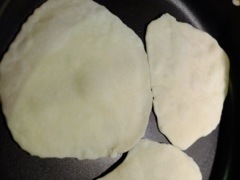 Not like a eggy pancake, but you will see the pancake rise in places. Turn it over and cook the other side. 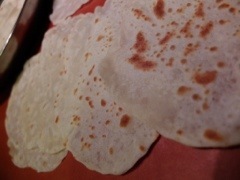 Once you see nice brown spots on it, they are done! It will take about 45 seconds for each side. 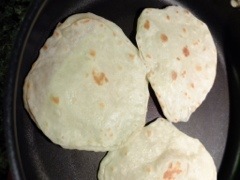 Lift out, and place on a plate and let it rest for about a minute before carefully peeling the two paired pancakes by running your finger between them to break the seal, let the steam escape, and then carefully peel the top pancake from the bottom pancake. They look quite inviting with the irregular shapes. 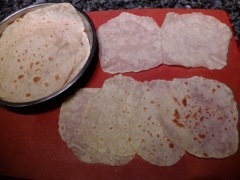 9) tease apart the first lot of cooked pancake pairs which had been set aside in step 5). So essentially you move between your board, the pan and the plate with the cooked pancakes. Once you get into a pattern, it will take no time to finish them all, and they will look identical in colour. The hero of this dish is the duck, so don’t carve into it too early or risk draining the wonderful juices that are inside. I have to admit I don’t like to eat the visible fat that lines the duck skin, so when slicing I would try to remove as much of them as possible. I removed the legs and wings first, so that I have a wider surface to carve the skin and meat from (traditionally only the skin is eaten! 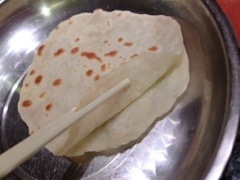 The meat is reserved to make a secondary dish, like Sang Choy Bow, but I like the meat in these pancakes so I would carve the meat out along with the skin). Chop cucumber and spring onions into similar sized lengths, usually the length of your finger, and put some Hoisin sauce in a small dish for serving. 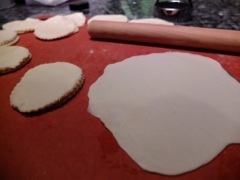 To assemble, you pick up a piece of the pancake. Spread a little spoonful of hoisin sauce on it and place a piece of duck on. 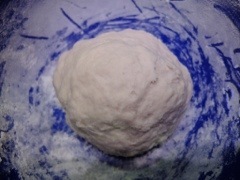 Top with some cucumber and spring onion slices, and roll it up tight. 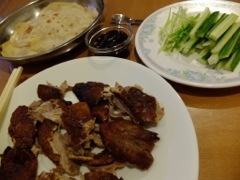 The gorgeous smell of the flour pancake mixed with the duck is purely addictive. Don’t say I didn’t warn you, so make you make enough for everyone. Give it a try, this is a fun dish!